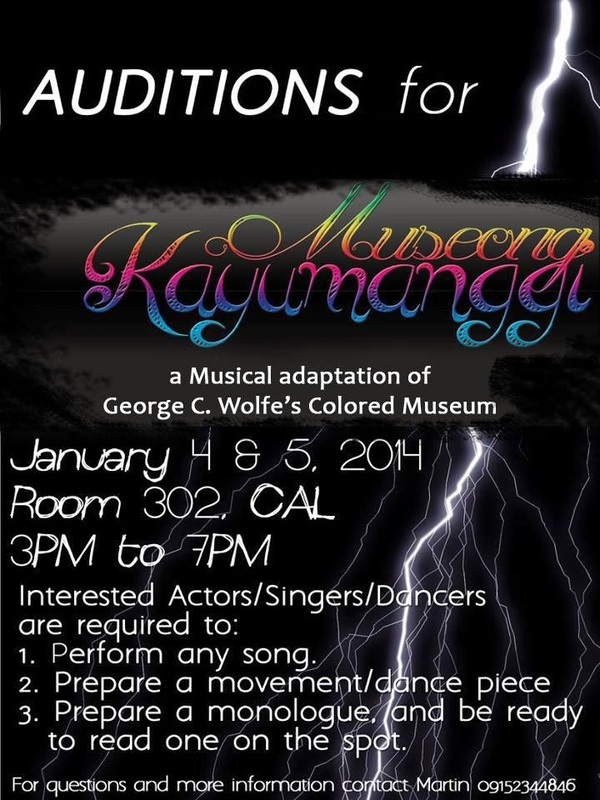 The Intersections & Beyond: Auditions: UP Dulaang Laboratoryo's "Museong Kayumanggi"
Auditions: UP Dulaang Laboratoryo's "Museong Kayumanggi"
UP Dulaang Laboratoryo will be having an open auditions for its new production, Museong Kayumanggi, a musical adaptation of George C. Wolfe's Colored Museum. This will be held on January 4 & 5, 2014 (3-7pm) at College of Arts & Letters Room 302, University of the Philippines in Diliman, Quezon City. 3. prepare a monologue, and be ready to read one on the spot. For questions and more information contact: Martin - 09152344846.